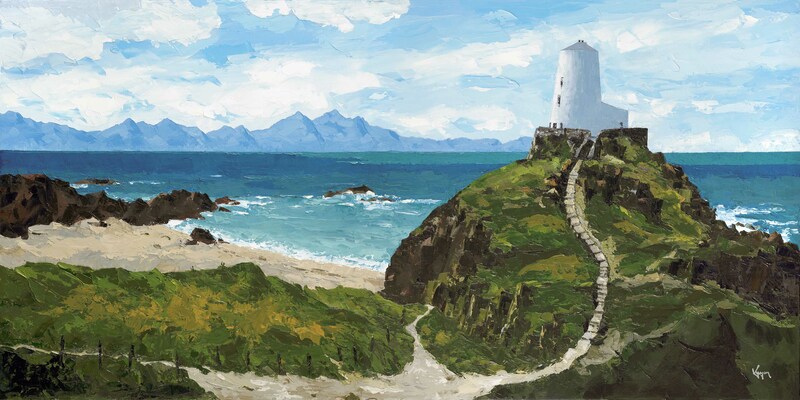 Llanddwyn Island is part of the Newborough Warren National Nature Reserve and is situated near the southern entrance to the Menai Strait. It provides excellent views of Snowdonia and the Lleyn Peninsula and is a wonderful backdrop to this magical place. A distinctive lighthouse, Tŵr Mawr, which was modelled on the windmills of Anglesey, was built nearby in 1845. Having visited the site a few years ago, I was so impressed with the location I knew one day that I would paint this unique and memorable scene. The large format canvas allowed me to ‘loosen’ up a little with my palette strokes and enjoy the real passion of painting.